Here in France the 14th of February is still called Saint Valentine day, La Saint Valentin. As far as celebrations go, the pattern is pretty much as it is in the U.S.: Dining out, chocolates, flowers, candelit dinners at home, love notes left on pillows. It’s an important enough holiday to warrant plenty of television and newspaper coverage. Libération one of the three national dailies, actually included a special Saint Valentine insert. For history buffs, it related how, in lore at least, Saint Valentine was famous for defying an emperor. The emperor wanted to staff his army but too many men resisted, preferring life at home with a wife to that in battle gear. Solution: forbid marriages. Valentine (3d century) married people on the sly anyway. He was executed, a martyr to conjugal love. The United States was given its due in several ways. Esther Howland, a Massachusetts artist, was mentioned as the first person to come up with Valentine’s cards (see image). Although Saint Valentine belongs to Europe, the tradition of making February 14 a major day did not really get going until the World War II arrival of GIs. They made their presence felt in many more important ways, but one legacy involved setting aside Valentine’s day as an important occasion for expressing one’s love. Contemporary Hollywood is also well estabished here. Asked about the people who best represent the holiday of love, the French chose George Clooney and Scarlett Johansson. Speaking of the U.S., a creative soul at the web site ironic sans has developed science-themed love cards. Darwin is featured on the one pictured here. Marie Curie, Newton, and Carl Sagan figure prominently in others. Also from the U.S., a study tracking changing attitudes toward relationships. In the 1930s, when marriages were more stable, love and attraction did not even make it in the top three reasons for choosing a mate. Today, a more precarious time for marriages, love and attraction rank at the top. See the story here. A few women cited in French news stories indicate how precarious indeed is today’s love scene. One admitted always celebrating la saint valentin, though not often with the same partner, “but always with gusto.” Another remembered a candlelit dinner interrupted by her honest admission that, sorry, there’s no more cheese in the relationship, it’s all over. Two French towns make of themselves tourist attractions for Feb. 14. Not far from here is the village of Roquemaure. Its church claims the relics of a Saint Valentine (there are apparently three saints with this name). The locals had gone to Rome in search of relics that would bring a halt to phylloxera, the wood louse that ruins grape vines. All they could afford was St. Valentine. The relic probably did not do much for the vineyards, but today the town’s chamber of commerce knows how to exploit the link between its relics and the holiday of love. The events culminate in a great procession, with the locals dressed in costumes of yore. 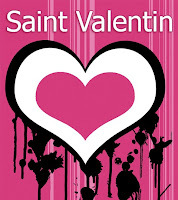 Even better than having the saint’s relics would be to have a town actually named Saint Valentin. Well, there is one, and it too knows how to draw in the tourist cash. During the French Revolution, the purist, anti-religious ideologues who had the upper hand, actually renamed the town La Cadoue. In the new world announced by the revolution, no towns would carry the names of saints. Fortunately for local businesses, the old name was restored. Now, the town hall, appropriately adorned by a heart, welcomes lovers in mid-February every year.